Retirement Savings Guidelines: How Much Should You Save and by When? Retirement can mean different things to different people, but one aspect remains constant: having some kind of retirement savings in order to pay your living expenses if you will no longer receive a paycheck or other income. 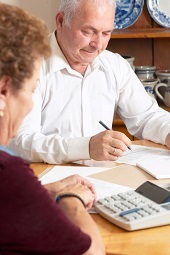 Determining how much to save for retirement can be tricky and will vary from person to person. You can use the following steps as a guide to figure out how much to save at each stage of your life. Retirement could seem like a long way off, but it’s important to establish a savings target so that you can plan how much to contribute to your retirement savings. Many financial planners recommend saving between 10 and 15 percent of income, starting as early as in your 20s. Many free tools are available online to help you quickly see if you are on the right track, such as this retirement calculator. Fidelity Investments has a handy salary multiplier to help estimate how much you should have in savings at different ages. Assuming a 7 percent annual return, a person who invests $5,000 annually between the ages of 25 and 35 (a total investment of $50,000) will have $562,683 in retirement savings by the time he or she turns 65. On the other hand, someone who invests $5,000 annually between the ages of 35 and 65 (a total investment of $150,000) at the same 7 percent annual return will have $505,365 at age 65 – $57,318 less than the first person. A third person who invests $5,000 annually from age 25 to age 65 (a total investment of $200,000), will have $1,068,048 at age 65. The moral of the story? Save early, often and consistently. Avoid borrowing from your retirement savings. It’s common sense. If you withdraw from your retirement savings early or miss a contribution, you’ll have less overall savings and less compounding of savings. If you can, leave your retirement savings alone. Consider accessing your retirement savings as a last resort. Don’t rely on outside sources of income. Social Security, pensions, health care costs, living expenses, and future employment are not set in stone. You should never consider these kinds of income or costs as guaranteed or definite. Take responsibility for funding your retirement yourself.